Don't let your customers missing your sales and promotions! 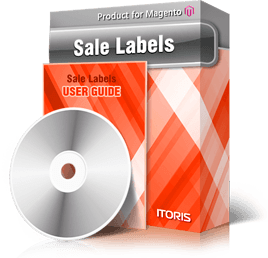 Show sale or text labels directly in product images on catalog and the product view. On Sale Label. Shown if the product has the special or group price. You can change the label text, e.g. SALE, ON SALE, etc. globally for all products, or for each product individually. Special Price Label. Shows the discount in one of selected formats: Old Price / New Price, New Price Only, Discount Amount, Discount Percent. By default the label is shown on a "star" image. However, you can upload your own transparent background for the label. Discount Label. Shown if the product has tier prices. The label is editable, e.g. DISCOUNTS!, or DONT MISS OUR DISCOUNTS. You can also edit the label of each product separately, e.g. UP TO 30% OFF! Out of Stock Label. Shown if the product is currently out of stock. You can also edit the the label for each product individually. Each label is adjustable and customizable. You can change texts, formats, colors using a handy color picker for products globally or per product. Enable the labels for catalog images, the main image on the product view, or the images thumbnails. The great advantage is that the module places label directly on the image, and not over the image in a DIV like most of extensions on the market do.